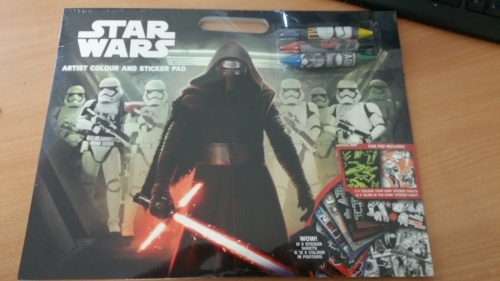 1 X STACS - Star Wars Artist Colour & Sticker Pad. 12 sticker sheets (including 2 x Colour Your Own sticker sheets and 1 x glow in the dark sticker sheet) plus 12 x colour in posters. 6 double ended crayons included. 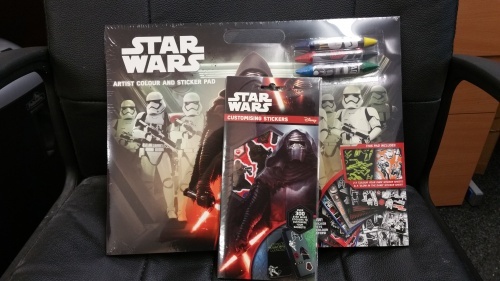 1 X Stars Wars STCVS - Over 300 stickers to customise your gadgets. 6 sheets of reusable vinyl stickers. Great stocking filler. Great Gift.